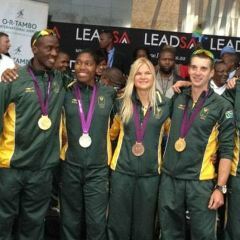 Johannesburg - South Africa's Olympic medallists left OR Tambo airport in Johannesburg on Tuesday for a whirl of engagements, but not before receiving cheques for their achievements. Besides the value attached to her silver medal, runner Caster Semenya received a cheque for R200,000 from the SA Sports Confederation and Olympic Committee. Her coach Maria Mutola got R50 000. Swimmer Cameron van der Burgh received R400 000 for his gold for breaststroke, and his coach Dirk Lange R100,000. Chad le Clos got R400 000 for his 200m butterfly win and another R200 000 for tying for silver in the 100m butterfly. His coach Graham Hill received R150 000. Bridgitte Hartley got R80 000 for her bronze in the women's kayak single K1-500m sprint, won on Women's Day in South Africa, and her coach Nandor Amalsi received R20 000. Rowers Sizwe Ndlovu, Matthew Brittain, John Smith and James Thompson each got R100 000 for their gold in the men's lightweight four. Their coach/manager Roger Barrow and coach Paul Jackson went up to be photographed together for the R100 000 coach's cheque. Sports Minister Fikile Mbalula said the cheques were not enough and that funders had to start "putting their money where there mouth is". "And this is where your mouth is," he said, pointing at the athletes. At a press conference on Monday, he said athletes such as Le Clos were role models. "I don't want Chad to travel by taxi to go and swim," he said. He said the Olympic team had restored the nation's pride. "There are no words that can describe the joy you have delivered. I don't think you can completely understand what you have done to this great nation," he told the medallists. "Today we are united, black and white, because of your deeds... what you have done will remain in the annals of history." On Monday, sport director general Alec Moemi said the department gave Sascoc R48 million for Olympic preparations -- R12m a year in the four-year build up. They also helped with other funding, such as when the men's hockey team stood a chance of qualifying in Japan, and when Banyana Banyana needed to go to Ghana and Germany. Swimming SA was given R3m. Money was also given to the rowers and the Paralympians among others. The Lotto and sponsors such as Telkom also provided funds.